Rumbi’s post of last week on ransomware got me thinking on a long drive back from Washington about what an excellent tool the AICPA’s new Cybersecurity Risk Management Reporting Framework is, not only for CPAs but for CFEs as well as for all our client organizations. As the seemingly relentless wave of cyberattacks continues with no sign of let up, organizations are under intense pressure from key stakeholders and regulators to implement and enhance their cyber security and fraud prevention programs to protect customers, employees and all the types of valuable information in their possession. According to research from the ACFE, the average total cost per company, per event of a data breach is $3.62 million. Initial damage estimates of a single breach, while often staggering, may not take into account less obvious and often undetectable threats such as the theft of intellectual property, espionage, destruction of data, attacks on core operations or attempts to disable critical infrastructure. These effects can knock on for years and have devastating financial, operational and brand impact ramifications. Given the present broad regulatory pressures to tighten cyber security controls and the visibility surrounding cyberrisk, a number of proposed regulations focused on improving cyber security risk management programs have been introduced in the United States over the past few years by our various governing bodies. One of the more prominent is a regulation by the New York Department of Financial Services (NYDFS) that prescribes certain minimum cyber security standards for those entities regulated by the NYDFS. Based on an entity’s risk assessment, the NYDFS law has specific requirements around data encryption and including data protection and retention, third-party information security, application security, incident response and breach notification, board reporting, and required annual re-certifications. However, organizations continue to report to the ACFE regarding their struggle to systematically report to stakeholders on the overall effectiveness of their cyber security risk management programs. In response, the AICPA in April of last year released a new cyber security risk management reporting framework intended to help organizations expand cyberrisk reporting to a broad range of internal and external users, to include management and the board of directors. The AICPA’s new reporting framework is designed to address the need for greater stakeholder transparency by providing in-depth, easily consumable information about the state of an organization’s cyberrisk management program. The cyber security risk management examination uses an independent, objective reporting approach and employs broader and more flexible criteria. For example, it allows for the selection and utilization of any control framework considered suitable and available in establishing the entity’s basic cyber security objectives and in developing and maintaining controls within the entity’s cyber security risk management program irregardless of whether the standard is the US National Institute of Standards and Technology (NIST)’s Cybersecurity Framework, the International Organization for standardization (ISO)’s ISO 27001/2 and related frameworks, or even an internally developed framework based on a combination of sources. The examination is voluntary, and applies to all types of entities, but should be considered by CFEs as a leading practice that provides management, boards and other key stakeholders with clear insight into the current state of an organization’s cyber security program while identifying gaps or pitfalls that leave organizations vulnerable to cyber fraud and other intrusions. What stakeholders might benefit from a client organization’s cyber security risk management examination report? Clearly, we CFEs as we go about our routine fraud risk assessments; but such a report, most importantly, can be vital in helping an organization’s board of directors establish appropriate oversight of a company’s cyber security risk program and credibly communicate its effectiveness to stakeholders, including investors, analysts, customers, business partners and regulators. By leveraging this information, boards can challenge management’s assertions around the effectiveness of their cyberrisk management and fraud prevention programs and drive more effective decision making. Active involvement and oversight from the board can help ensure that an organization is paying adequate attention to cyberrisk management and displaying due diligence. The board can help shape expectations for reporting on cyberthreats while also advocating for greater transparency and assurance around the effectiveness of the program. The cyber security risk management report in its initial and follow-up iterations can be invaluable in providing overview guidance to CFEs and forensic accountants in targeting both fraud prevention and fraud detection/investigative analytics. We know from our ACFE training that data analytics need to be fully integrated into the investigative process. Ensuring that data analytics are embedded in the detection/investigative process requires support from all levels, starting with the managing CFE. It will be an easier, more coherent process for management to support such a process if management is already supporting cyber security risk management reporting. Management will also have an easier time reinforcing the use of analytics generally, although the data analytics function supporting fraud examination will still have to market its services, team leaders will still be challenged by management, and team members will still have to be trained to effectively employ the newer analytical tools. The presence of a robust cyber security risk management reporting process should also prove of assistance to the lead CFE in establishing goals for the implementation and use of data analytics in every investigation, and these goals should be communicated to the entire investigative team. It should be made clear to every level of the client organization that data analytics will support the investigative planning process for every detected fraud. The identification of business processes, IT systems, data sources, and potential analytic routines should be discussed and considered not only during planning, but also throughout every stage of the entire investigative engagement. Key in obtaining the buy-in of all is to include investigative team members in identifying areas or tests that the analytics group will target in support of the field work. Initially, it will be important to highlight success stories and educate managers and team leaders about what is possible. Improving on the traditional investigative approach of document review, interviewing, transaction review, etc. investigators can benefit from the implementation of data analytics to allow for more precise identification of the control deficiencies, instances of noncompliance with policies and procedures, and mis-assessment of areas of high risk that contributed to the development of the fraud in the first place. These same analytics can then be used to ensure that appropriate post-fraud management follow-up has occurred by elevating the identified deficiencies to the cyber security risk management reporting process and by implementing enhanced fraud prevention procedures in areas of higher fraud risk. This process would be especially useful in responding to and following up data breaches. Once patterns are gathered and centralized, analytics can be employed to measure the frequency of occurrence, the bit sizes, the quantity of files executed and average time of use. The math involved allows an examiner to grasp the big picture. Individuals, including examiners, are normally overwhelmed by the sheer volume of information, but automation of pattern recognizing techniques makes big data a tractable investigative resource. The larger the sample size, the easier it is to determine patterns of normal and abnormal behavior. Network haystacks are bombarded by algorithms that can notify the CFE information archeologist about the probes of an insider threat for example. Without analytics, enterprise-level fraud examination and risk assessment is a diminished discipline, limited in scope and effectiveness. Without an educated investigative workforce, armed with a programing language for automation and an accompanying data-mining philosophy and skill set, the control needs of management leaders at the enterprise level will go unmet; leaders will not have the data needed for fraud prevention on a large scale nor a workforce that is capable of getting them that data in the emergency following a breach or penetration. The beauty of analytics, from a security and fraud prevention perspective, is that it allows the investigative efforts of the CFE to align with the critical functions of corporate business. It can be used to discover recurring risks, incidents and common trends that might otherwise have been missed. Establishing numerical baselines on quantified data can supplement a normal investigator’s tasks and enhance the auditor’s ability to see beneath the surface of what is presented in an examination. Good communication of analyzed data gives decision makers a better view of their systems through a holistic approach, which can aid in the creation of enterprise-level goals. Analytics and data mining always add dimension and depth to the CFE’s examination process at the enterprise level and dovetail with and are supported beautifully by the AICPA’s cyber security risk management reporting initiative. –understanding of the employing enterprise’s data concepts (data elements, record types, database types, and data file formats). –understanding of logical and physical database structures. –the ability to communicate effectively with IT and related functions to achieve efficient data acquisition and analysis. –the ability to perform ad hoc data analysis as required to meet specific fraud examiner and fraud prevention objectives. –the ability to design, build, and maintain well-documented, ongoing automated data analysis routines. –the ability to provide consultative assistance to others who are involved in the application of analytics. As fraud examiners and forensic accountants intimately concerned with the on-going state of health of our client’s fraud management programs, we find ourselves constantly looking at the integrity of the critical data that’s truly (as much as financial capital) the life blood of today’s organizations. We’re constantly evaluating the network of anti-fraud controls we hope will help keep those pesky, uncontrolled, random data driven vulnerabilities to fraud to a minimum. Every little bit of critical financial information that gets mishandled or falls through the cracks, every transaction that doesn’t get recorded, every anti-fraud policy or procedure that’s misapplied has some effect on the client’s overall fraud management picture and on our challenge. When it comes to managing its client, financial and payment data, almost every small to medium sized organization has a Sandy. Sandy’s the person to whom everyone goes to get the answers about data, and the state of system(s) that process it; quick answers that no one else ever seems to have. That’s because Sandy is an exceptional employee with years of detailed hands-on-experience in daily financial system operations and maintenance. Sandy is also an example of the extraordinary level of dependence that many organizations have today on a small handful of their key employees. The now unlamented great recession, during which enterprises relied on retaining the experienced employees they had rather than on traditional hiring and cross-training practices, only exacerbated an existing, ever growing trend. The very real threat to the Enterprise Fraud Management system that the Sandy’s of the corporate data world pose is not so much that they will commit fraud themselves (although that’s an ever-present possibility) but that they will retire or get another job across town or out of state, taking their vital knowledge of company systems and data with them. The day after Sandy’s retirement party and, to an increasing degree thereafter, it will dawn on Sandy’s management that it’s lost a large amount of information about the true state of its data and financial processing system(s). Management will also become aware, if it isn’t already, of its lack of a large amount of system critical data documentation that’s been carried around nowhere else but in Sandy’s head. The point is that, for some smaller organizations, their reliance on a few key employees for day to day, operationally related information goes well beyond what’s appropriate and constitutes an unacceptable level of risk to their entire fraud prevention programs. Today’s newspapers and the internet are full of stories about hacking and large-scale data breeches, that only reinforce the importance of vulnerable data and of the completeness of its documentation to the on-going operational viability of our client organizations. Anyone whose investigated frauds involving large scale financial systems (insurance claims, bank records, client payment information) is painfully aware that when the composition of data changes (field definitions or content) surprisingly little of change related information is formally documented. Most of the information is stored in the heads of some key employees, and those key employees aren’t necessarily involved in everyday, routine data management projects. There’s always a significant level of detail that’s gone undocumented, left out or to chance, and it becomes up to the analyst of the data (be s/he an auditor, a management scientist, a fraud examiner or other assurance professional) to find the anomalies and question them. The anomalies might be in the form of missing data, changes in data field definitions, or changes in the content of the fields; the possibilities are endless. Without proper, formal documentation, the immediate or future significance of these types of anomalies for the fraud management system and for the overall fraud risk assessment process itself become almost impossible to determine. If our auditor or fraud examiner, operating under today’s typical budget or time constraints, is not very thorough and misses the identification of some of these anomalies, they can end up never being addressed. How many times as an analyst have we all tried to explain something (like apparently duplicate transactions) about the financial system that just doesn’t look right only to be told, “Oh, yeah. Sandy made that change back in February before she retired; we don’t have too many details on it.” In other words, undocumented changes to transactions and data, details of which are now only existent in Sandy’s no longer available head. When a data driven system is built on incomplete information, the system can be said to have failed in its role as a component of the origination’s fraud prevention program. The cycle of incomplete information gets propagated to future decisions, and the cost of the missing or inadequately explained data can be high. What can’t be seen, can’t ever be managed or even explained. In summary, it’s a truly humbling to experience to be confronted with how much critical financial information resides in the fading (or absent) memories of past or present key employees; what the ACFE calls authority figures. As fraud examiners we should attempt to foster a culture among our clients supportive of the development of concurrent systems of transaction related documentation and the sharing of knowledge on a consistent basis about all systems but especially regarding the recording of changes to critical financial systems. One nice benefit of this approach, which I brought to the attention of one of my audit clients not too long ago, would be to free up the time of one of these key employees to work on more productive fraud control projects rather than serving as the encyclopedia for the rest of the operational staff. Our Chapter’s thanks to all our attendees and to our partners, the Virginia State Police and national ACFE for the unqualified success of our May training event, Cyberfraud and Data Breaches! Our speaker, Cary Moore, CFE, CISSP, conducted a fully interactive, two-day session on one of the most challenging and relevant topics confronting practicing fraud examiners and forensic accountants today. The event examined the potential avenues of data loss and guided attendees through the crucial strategies needed to mitigate the threat of malicious data theft and the risk of inadvertent data loss, recognizing that information is a valuable asset, and that management must take proactive steps to protect the organization’s intellectual property. As Cary forcefully pointed out, the worth of businesses is no longer based solely on tangible assets and revenue-making potential; the information the organization develops, stores, and collects accounts for a large share of its value. A data breach occurs when there is a loss or theft of, or unauthorized access to, proprietary information that could result in compromising the data. It is essential that management understand the crisis its organization might face if its information is lost or stolen. Data breaches incur not only high financial costs but can also have a lasting negative effect on an organization’s brand and reputation. Protecting information assets is especially important because the threats to such assets are on the rise, and the cost of a data breach increases with the number of compromised records. According to a 2017 study by the Ponemon Institute, data breaches involving fewer than 10,000 records caused an average loss of $1.9 million, while beaches with more than 50,000 compromised records caused an average loss of $6.3 million. However, before determining how to protect information assets, it is important to understand the nature of these assets and the many methods by which they can be breached. Intellectual property is a catchall phrase for knowledge-based assets and capital, but it’s helpful to think of it as intangible proprietary information. Intellectual property (IP) is protected by law. IP law grants certain exclusive rights to owners of a variety of intangible assets. These rights incentivize individuals, company leaders, and investors to allocate the requisite resources to research, develop, and market original technology and creative works. • Be secret: The information is not generally known to the relevant portion of the public. • Confer some sort of economic benefit on its holder: The idea or information must give its owner an advantage over its competitors. The benefit conferred from the information, however, must stem from not being generally known, not just from the value of the information itself. The best test for determining what is confidential information is to determine whether the information would provide an advantage to the competition. • Be the subject of reasonable efforts to maintain its secrecy: The owner must take reasonable steps to protect its trade secrets from disclosure. That is, a piece of information will not receive protection as a trade secret if the owner does not take adequate steps to protect it from disclosure. –Proprietary information is among the most valuable commodities, and attackers are doing everything in their power to steal as much of this information as possible. –The risk of data breaches for organizations is high. –New and emerging technologies create new risks and vulnerabilities. — IT environments are becoming increasingly complex, making the management of them more expensive, difficult, and time consuming. –There is a wider range of devices and access points, so businesses must proactively seek ways to combat the effects of this complexity. –The rise in portable devices is creating more opportunities for data to “leak” from the business. –The rise in Bring Your Own Device (BYOD) initiatives is generating new operational challenges and security problems. –The rapidly expanding Internet of Things (IoT) has significantly increased the number of network connected things (e.g., HVAC systems, MRI machines, coffeemakers) that pose data security threats, many of which were inconceivable only a short time ago. –The number of threats to corporate IT systems is on the rise. –Malware is becoming more sophisticated. –There is an increasing number of laws in this area, making information security an urgent priority. Cary covered the entire gamut of challenges related to cyber fraud and data breaches ranging from legal issues, corporate espionage, social engineering, the use of social media, the bring-your-own-devices phenomenon, and the impact of cloud computing. 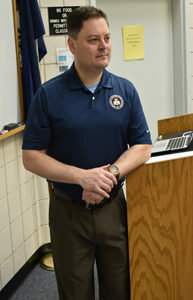 The remaining portion of the event was devoted to addressing how enterprises can effectively respond when confronted by the challenges posed by these issues including breach response team building and breach prevention techniques like conducting security risk assessments, staff awareness training and the incident response plan. When an organization experiences a data breach, management must respond in an appropriate and timely manner. During the initial response, time is critical. To help ensure that an organization responds to data breaches timely and efficiently, management should have an incident response plan in place that outlines how to respond to such issues. Timely responses can help prevent further data loss, fines, and customer backlash. An incident response plan outlines the actions an organization will take when data breaches occur. More specifically, a response plan should guide the necessary action when a data breach is reported or identified. Because every breach is different, a response plan should not outline how an organization should respond in every instance. Instead, a response plan should help the organization manage its response and create an environment to minimize risk and maximize the potential for success. In short, a response plan should describe the plan fundamentals that the organization can deploy on short notice. Again, our sincere thanks go out to all involved in the success of this most worthwhile training event! Information theft by insiders is of special concern when employees leave an organization. Often, employees leave one organization for another, taking with them the knowledge of how their former organization operates, as well as its pricing policies, manufacturing methods, customers, and so on. • Employees: employee insiders are employees with rights and access associated with being employed by the organization. • Associates: insider associates are people with physical access to an organization’s facilities, but they are not employees of the organization (e.g., contractors, cleaning crews). • Affiliates: insider affiliates are individuals connected to pure insiders or insider associates (e.g., spouse, friend, client), and they can use the credentials of those insiders with whom they are connected to gain access to an organization’s systems or facilities. • Living beyond his or her means. Zealots are trusted insiders with strong and uncompromising beliefs that clash with their organization’s perspectives on certain issues and subjects. Zealots pose a threat because they might exploit their access or inside knowledge to “reform” their organizations. • Halting services or the production of products. Zealots believe that their actions are just, no matter how much damage they cause. A spy is an individual who is intentionally placed in a situation or organization to gather intelligence. A well-placed corporate spy can provide intelligence on a target organization’s product development, product launches, and organizational developments or changes. Spies are common in foreign, business, and competitive intelligence efforts. • Gaining a personal advantage over their peers. Browsers can be the hardest insider threat to identify, and they can be even harder to defeat. • Failing to shred or destroy sensitive information. While well-intentioned individuals might be stellar employees when it comes to work production, their ignorance or laziness regarding information security practices can be disastrous. • Create an insider threat program. To combat insider threats, management should form an insider threat team, create related policies, develop processes and implement controls, and regularly communicate those policies and controls across the organization. • Work together across the organization. To be successful, efforts to combat insider threats should be communicated across the silos of management, IT, data owners, software engineers, general counsel, and human resources. • Address employee privacy issues with general counsel. Because employees have certain privacy rights that can affect numerous aspects of the employer-employee relationship, and because such rights may stem from, and be protected by, various elements of the law, management should consult legal counsel whenever addressing actions impacting employee privacy. • Pay close attention at times of resignation/ termination. Because leaving an organization is a key time of concern for insider threats, management should be cautious of underperforming employees, employees at risk of being terminated, and of employees who will likely resign. • Educate managers regarding potential recruitment. Management should train subordinates to exercise due diligence in hiring prospective employees. • Recognize concerning behaviors as a potential indicator. Management must train managers and all employees to recognize certain behaviors or characteristics that might indicate employees are committing or are at risk of committing a breach. Common behavioral red flags are living beyond one’s financial means, experiencing financial difficulties, having an uncommonly close relationship with vendors or customers, and demonstrating excessive control over their job responsibilities. • Mitigate threats from trusted business partners. Management should subject their organization’s contractors and outsourced organizations to the same security controls, policies, and procedures to which they subject their own employees. • Use current technologies differently. Most organizations have implemented technologies to detect network intrusions and other threats originating outside the network perimeter, and organizations with such technologies should use them to the extent possible to detect potential indicators of malicious insider behavior within the network. • Focus on protecting the most valuable assets. Management should dedicate the most effort to securing its most valuable organizational assets and intellectual property against insider threats. • Learn from past incidents. Past incidents of insider threats and abuse will suggest areas of vulnerability that insiders will likely exploit again. • Focus on deterrence, not detection. In other words, create a culture that deters any aberrant behavior so that those who continue to practice that behavior stand out from the “noise” of normal business; focus limited investigative resources on those individuals. • Know your people—know who your weak links are and who would be most likely to be a threat. Use human resources data to narrow down threats rather than looking for a single needle in a pile of needles. • Identify information that is most likely to be valuable to someone else and protect it to a greater degree than the rest of your information. • Monitor ingress and egress points for information (e.g., USB ports, printers, network boundaries). • Baseline normal activity and look for anomalies. • Educate employees as to what information is proprietary and confidential. • Require that all employees and third-party vendors and contractors sign nondisclosure agreements; written agreements providing that all proprietary and confidential information learned during their relationship must be kept confidential and must not be disclosed to anyone, upon the commencement and termination of employment or contracts. • Ensure that all an organization’s third-party vendors and contractors perform background checks on all third-party employees who will have access to the organization’s information systems. • Prohibit employees, contractors, and trusted business partners from printing sensitive documents that are not required for business purposes. • If possible, avoid connecting information systems to those of business partners. Also, when possible, management should conduct exit interviews with departing employees. During an exit interview, the departing employee should be advised about the organization’s trade secrets and confidential information, as well as any obligation not to disclose or use such information for his or her own benefit or for the benefit of others without express written consent. Also, the employee should be given a form to sign stating that s/he was informed that any proprietary information should not be disclosed and that s/he agrees not to disclose any such information without consent. Finally, when management terminates its relationship with an insider, it should immediately deactivate the insider’s access to company tools and resources. Please consider joining us for at our May 16th and 17th Spring training event, Cyber Fraud and Data Breaches for 16 CPE credits! You may register and pay on-line here.